Not all the mysteries of the cosmos hidden in kiloparsecs from Earth. There are puzzles that are associated with the much closer to us objects, for example, with the Moon. For seven years, the Lunar Reconnaissance Orbiter camera closely monitoring our space neighbor. During this time, the station helped to catalog the many craters found deposits of water ice and even found evidence of recent volcanic activity. In addition, the device has witnessed disasters other space missions, in particular LCROSS. Lunar Reconnaissance Orbiter found water ice lies in unexpected areas. Previous missions have repeatedly found water on the moon, but accurate maps of distribution of ice to keep them failed. 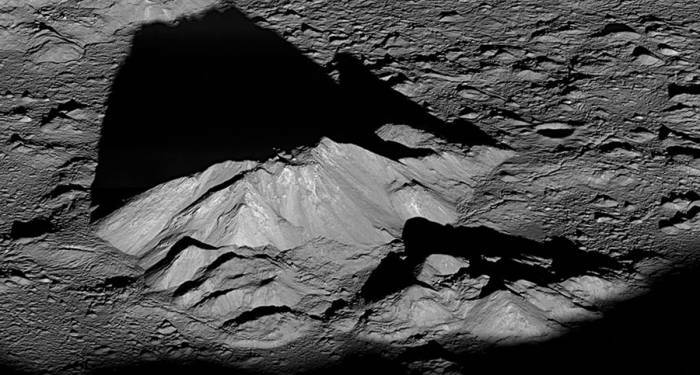 For a long time, scientists believed that the water is in the shadow of craters at the lunar poles, and LRO has confirmed these guesses. However, the machine is allowed to determine that in these areas focus not all the ice is part of water occurs in the soil, which is constantly illuminated by the Sun. “It surprised us. It seems that temperature is not the only factor determining the distribution of water on the moon. In the shadows at the poles, where the temperature is -250°C, water ice can survive billions of years. However, in other places, apparently, water is not so long ago, and it seems to protect the soil,” says John Keller (John Keller), a member of the LRO project. As water enters the soil, constantly illuminated by the Sun, remains a mystery. However, this is not the only mystery faced by scientists of the mission LRO. Camera found on the surface of the moon smooth dark areas with a small number of craters cooled lava lake, which is only 100 million years. “It goes against the fact that until now we knew about the moon. It was always thought that lunar volcanism ended a billion years ago,” says Noah Petro (Noah Petro), a lunar geologist. Some changes of the lunar surface quite fresh. In 2013’s earth Observatory recorded the flash of light on the moon. LRO checked the site and found vosemnadtsatimetrovoy crater. “The wreckage of the ground flew surprisingly far. Some of them fell 35 kilometers from the crater. It’s much more than can be expected in the fall of the stone with a diameter of about one meter,” — said Keller. One of the seven instruments installed on Board LRO, laser altimeter. Its beam scans the surface of the moon in minute detail. Using this device, scientists may discover old craters whose outlines are almost erased from the face of the moon. The obtained maps allow to detect the craters formed on top of other craters, and thereby reconstruct the chronology of meteoritic bombardment. Using samples of lunar soil brought back by astronauts, scientists can determine the age of each layer of the craters and to better understand the evolution of the system Earth — Moon, as well as the entire history of the Solar system.